The International Tourism Fair Fitur, that took place last week in Madrid has served as the escenario for a key event for responsible tourism: the meeting of the Biosphere Destination Community, companies and sustainable tourism bloggers from all over the world, gathered under the Biosphere seal. These are destinations that have been awarded the certification by the Responsible Tourism Institute (RTI), an international entity that supports companies and destinations around the world which seek to start the path towards sustainability. The International Tourism Fair Fitur that took place last week in Madrid has served as the escenario for a key event for responsible tourism: the meeting of the Biosphere Community of destinations, companies and sustainable tourism bloggers from all over the world, gathered under the Biosphere seal. These are destinations that have been awarded the certification by the Responsible Tourism Institute (RTI), an international entity that supports companies and destinations around the world which seek to start the path towards sustainability. 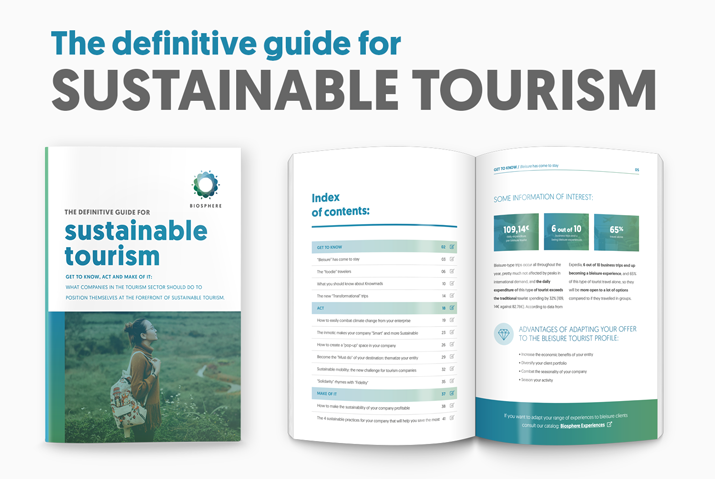 The Stand served to underline the leading role that destinations, companies and communicators should play as generators of trends that mitigate and eliminate negative impacts on the destination through their choices, recommendations and consumption of responsible and sustainable tourism products and experiences. 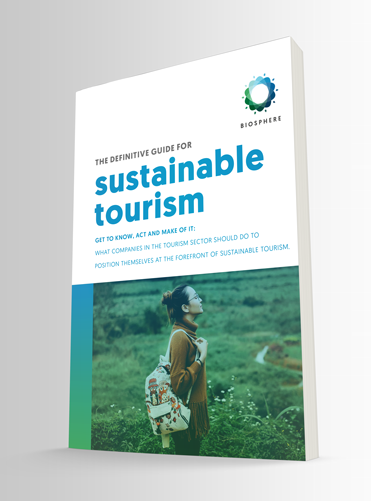 For this purpose and keeping a holistic vision in mind, the Biosphere Circle was built: a methodology that includes basic guidelines that all tourism agents can use as a tool for continuous improvement to start and stay on the path of sustainable tourism. 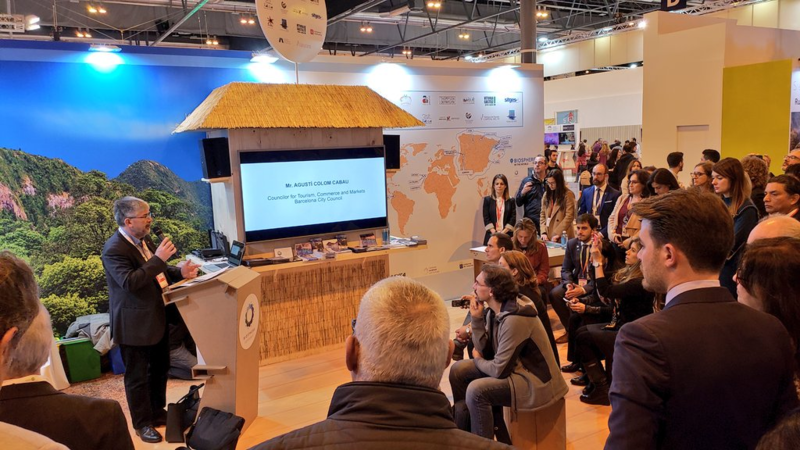 During the activities that took place at the Biosphere stand, in the Pavillion 9 of the Madrid Fair, the most important and recognizable voices in the field of responsible tourism met. They insisted on their commitment and responsibility to generate, maintain and communicate the values of responsible tourism among all. The events were divided into a series of presentations of certain Biosphere destinations (Historic Aldeias of Portugal, Barcelona, Ibagué-Tolima, Thompson Okanagan or Sitges, among others) and three large meetings in which were highlighted the importance of three large tourist groups: destinations, companies and communicators. Aldeias Históricas de Portugal used its presence at the Biosphere stand to share their best practices, resources, experiences and researches. The Executive Director of Aldeias Históricas, Dalila Marisa Dias and her team, signed with the Thompson Okanagan Tourism Association, represented by its CEO and President Glenn Mandziuk, the Board Chair, Frank Antoine and the Vice President Ellen Walker-Matthews, a Collaboration Agreement to share knowledge between both destinations. The Responsible Tourism Institute was present at the signing ceremony at the Biosphere stand. The Town Hall of Xàbia presented in the stand of the Responsible Tourism Institute (RTI) the most outstanding actions that have been launched in recent years, following their policy of promoting sustainable tourism and their bet on more quality than quantity. The mayor, José Chulvi, gave a presentation detailing these actions, such as Amjasa's "menys plastic més aixeta" campaign, the electric vehicle fleet of the municipal water company "the only one hundred percent public in the Region of Valencia", The protection of the territory with the 8 million square meters of land that are declassified in the new General Structural Plan, as well as the launch of the Pesca Turisme project to provide a new line of business for fishermen or the Sustainable Mediterranean Forum that the City Council organized two years ago. The Councilor for Tourism, Mª Ángeles Pujals, participated in the meeting of the "Biosphere Destination Community" at RTI Stand with the rest of destinations (including Tossa de Mar) that are committed to sustainability. During their participation experiences were shared as well as new challenges that will contribute to extend tourism sustainability in an international scenario. 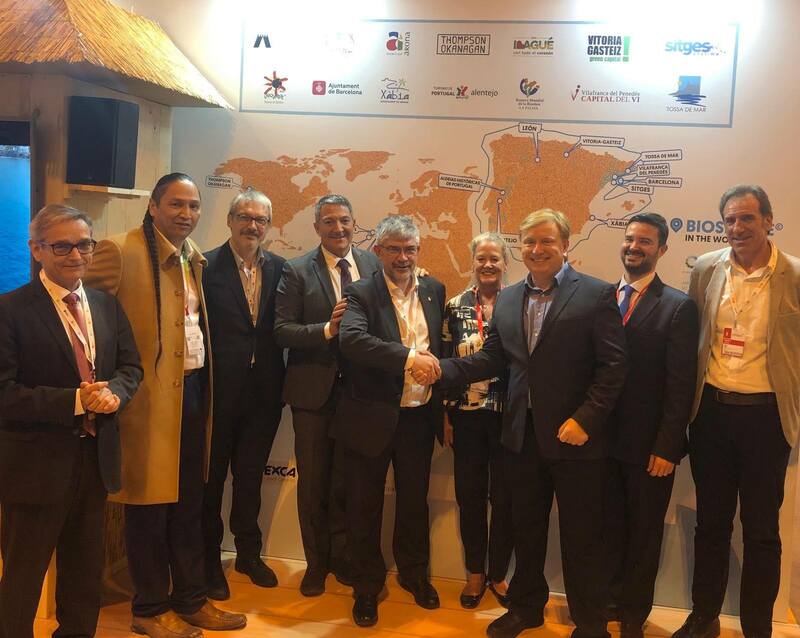 Barcelona participated in the meeting of the Biosphere Destination Community presenting the commitment of sustainability of the city and the relay in the direction of the Biosphere Community. The city handed over the baton to the Canadian region of Thompson Okanagan, in an act in which the work of the city was recognized for offering quality standards in the tourist offer and an environmentally and socially sustainable management of this activity. Barcelona is one of the 25 destinations around the world that holds this title, which will be revised again in 2020. The Island of the Volcanoes displayed its best credentials as a Biosphere Destination, showing its firm commitment to sustainability with its presence in two events of extraordinary importance from a strategic point of view. Lanzarote participated in the Biosphere Destination Community stand, presenting the position of Lanzarote as a sustainable destination, emphasizing its uniqueness and its historical route of respect and environmental care. On the other hand, within the framework of the Forum of Innovation and Tourism Technology FiturtechY 2019, the CEO of SPEL-Turismo Lanzarote, Héctor Fernández, participated in the panel discussion 'The social impact of tourism', within the forum #techYsostenibilidad, another event parallel to the Fair itself, but also of great relevance to be focused on the efficient and sustainable management of tourism, which was held under the slogan 'Tourism quality, sustainable and inclusive'. The Colombian municipality of Ibagué presented at the Biosphere stand the works it has carried out throughout 2018 in the framework of the Biosphere certification. Among them, and as the main driver of the tourism strategy, the development of the Sustainable Tourism Strategic Plan of Ibagué. Between the main strategic lines of the City Hall of Ibagué is to devote a great effort to position the city as a Sustainable Tourism Destination. The Municipal Development Plan "Por Ibagué con todo el Corazón 2016 - 2019" has opted to certify Ibagué with the BIOSPHERE distinction for the development of a sustainable and ecological tourism. Vilafranca del Penedès was present at the stand of Catalonia, as well as at the smart signage (Inventrip) and at the Biosphere stand. Vilafranca del Penedès had the opportunity to present the projects they are developing within the framework of sustainability, specifically the project "Vinyes por Calor". A project that stands out for giving a new focus and treatment to the pruning of the vineyard, being managed as an energy resource and not as waste. The project has resulted, among other things, in the creation of a "heat district" that provides thermal energy to four public facilities: Municipal Archive, Pedagogical Resource Center of Alt Penedès, Nursery "Parquet", Dolores Piera School, and shortly, the Ricard Fortuny Healthcare Center. The same day the Councilor for Tourism Promotion, Dolores Ríos, attended the annual meeting of the Biosphere Destination Community, the global community of sustainable destinations with the Biosphere certification. The highlight of the Biosphere stand was the meeting of the Biosphere Destination Community, a meeting which gathered all the destinations committed to tourism sustainability through the 17 Sustainable Development Goals of the United Nations, contained in the Biosphere methodology. The meeting was held on Thursday, January 24 from 11:30 a.m. to 12:30 a.m. at the Official Stand of the community located in Hall 9, stand 9A04 at the Fitur tourist fair (Madrid, Spain). During the meeting the efforts carried out by the community in an open and high impact event were shown, where all the member destinations participated, as well as other guests and communicators of interest. During the ceremony the change of baton from the city of Barcelona to the Canadian region of Thompson Okanagan took place, who will be the coordinator of the community of destinations during 2019. The Sitges delegation presented Sitges as a Biosphere destination and the Santa Bárbara Park project. The mayor of Sitges, Miquel Forns, stressed that "the offer of cultural tourism in Sitges, the calendar of events, highlighting this year the Jardines de Terramar Festival, Sitges as Biosphere destination and the synergies with global promotion companies, are the main objectives that we set in Fitur. " The Councilor for Economic Promotion, Tourism and Beaches, Aurora Carbonell, recalled that "for the first time we have a double presence in this international event. 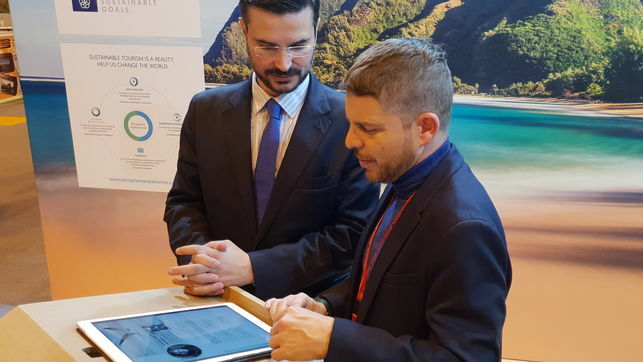 On the one hand at the stand of the Catalan Tourism Agency under the umbrella of the Diputación de Barcelona, and also on the stand of the Biosphere destinations, with a clear and determined commitment to a sustainable and responsible tourism ". Within the framework of Fitur 2019, the CETT (international center for training and knowledge transfer in hospitality, tourism and gastronomy, attached to the University of Barcelona) and the Responsible Tourism Institute (RTI) signed a collaboration agreement for training, which will follow the principles of responsible tourism and the 17 Sustainable Development Goals (SDGs) of the UN integrated into the 2030 Agenda. The CETT and the RTI propose to all stakeholders, from global public administrations to university centers, research institutes, business associations and workers, to "actively participate and contribute to the dissemination and training of principles and good practices that promote development of the World Charter for Sustainable Tourism +20 ". Both entities will develop an online training program that brings these objectives closer to the tourism sector. Vitoria-Gasteiz renewed its commitment to sustainable tourism in Fitur. Mayor Gorka Urtaran and the Secretary General of the Institute, Patricio Azcárate, held a meeting at the organization's stand. Mayor Gorka Urtaran transferred to the certifying organization "the involvement and commitment of the city's hotel sector in a significant action within the strategies of the city as a sustainable destination Biosphere. We understand the circular economy as a tool to improve your business, achieve savings and reduce your environmental footprint. It is important that the administration and the sector represented by hotels, agrotourism, but also by tour guides, transport companies of travelers, hotels and service providers join forces as a sustainable destination. Vitoria-Gasteiz was the first municipality in Euskadi to have the Biosphere Responsible Tourism certification that gives us greater visibility in the international tourist market and opens up new possibilities that can not be missed", the mayor recalled. With this meeting it was sought that more communicators joined the Biosphere Ambassadors in their struggle to achieve sustainable tourism and to end bad practices such as over-tourism. A change of model is required and to achieve it, Biosphere bet on travel bloggers who knows that are responsible for their power of communication and prescription. La Palma once again positioned its status as a sustainable destination and as a World Biosphere Reserve at the International Tourism Fair (Fitur). During Thursday afternoon, the destination made a presentation of the Island at the stand of the Responsible Tourism Institute (RTI), asserting their status as a Biosphere Destination with a gold badge. "This sustainable tourism model is a great challenge and is the responsibility of all the actors involved in tourism. There are already 190 companies in La Palma that have the distinctive Commitment to the Biosphere Destination" said the president. The municipality of Arona took advantage of the unbeatable framework of the Biosphere stand to present the Sustainable Arona magazine by the Councilor for Tourism at the City Council, David Pérez. Arona was the first municipality in the Canary Islands to be recognized by the Institute with the Biosphere certificate, which annually audits its commitment to sustainability. Along with the fact that sustainability is precisely one of the pillars of the new Plan of Tourism Competitiveness recently approved, the Biosphere Certification is a strategic point for the municipality as a tourist destination. David Pérez explained that this magazine facilitates the regular meeting of readers around the world with sustainability policies implemented in recent years by Arona, ranging from pioneering social programs activated against loneliness or the phenomenon of homeless people to the reuse (for the first time in the history of the municipality) of water for cleaning public spaces, through initiatives that combat discrimination or abuse in the classrooms, the enhancement of collective contributions like the LGTBIQ or the promotion of the coexistence between people of all origins, races and cultures. The Portuguese destination Alentejo took advantage of its presence at the Biosphere stand to share best practices, resources, experience and research. During their participation experiences were shared as well as new challenges that will contribute to extend tourism sustainability in an international scenario. 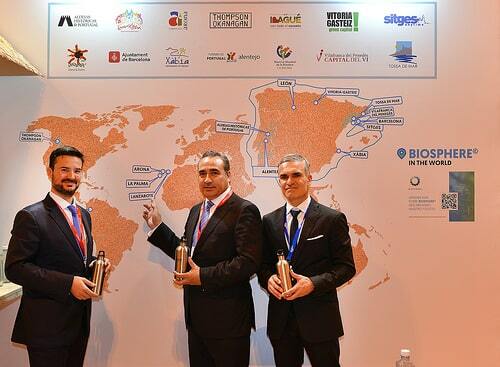 The province of León also distinguished itself by seeing its sustainability efforts rewarded at Fitur. The president of the Diputación, Juan Martínez Majo, received from the AireLibre magazine the award granted to the provincial institution for its commitment to Sustainable Tourism through the Biosphere certification. The specialized magazine wanted to reward the commitment of the Diputación for sustainable and responsible tourism that allowed it, last year, to achieve the Biosphere certification. Thompson Okanagan undoubtedly played a leading role in Fitur, as part of the Biosphere stand. After being commissioned to coordinate the Biosphere Destination Community, the CEO of the Thompson Okanagan Tourism Association said: "I am honoured to be with our Board Chair Frank Antoine and VP Ellen Walker-Matthews in Madrid, Spain at FITUR with our Biosphere Destination partners from around the globe. Today, I am also pleased to share that Barcelona Tourism (Visit Barcelona) and the Thompson Okanagan Tourism Association have agreed to establish a formal long-term MOU to share learnings and best practices on Sustainable Responsible Tourism".